Senior Veena vidwan Sri. R. Venkataraman, a recipient of Sangita Kala Acharya from The Music Academy this year died in an accident on Jan. 5, 2010. The 71 years old vidwan and his 40 years old daughter Jayashri were travelling in a car and while crossing a bridge, the car fell off from a height of 40 ft. Later both the father and the daughter were found dead near the newly constructed flyover on the national highway at Ulundurpet. Trivandrum R. Venkataraman, one of the finest exponents of Veena, played the instrument in a unique style with rare blend of tradition and modernity. He was part of the popular veena-venu-violin team along with violinist Lalgudi G. Jayaraman and flautist N. Ramani. Sri R. Venkataraman had his early training in veena from Smt. Lakshmi G. Krishnan. He later joined the Swati Tirunal College of Music. Trivandrum and graduated in veena and vocal in 1951. He had his advanced training under Sri. 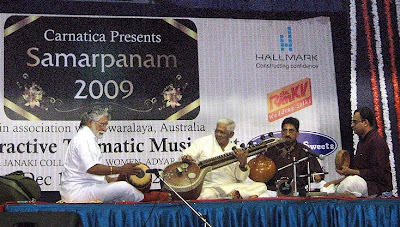 K. S. Narayanaswamy, another renowned veena vidwan. He then served as Assistant Professor of Veena at Sri Swati Tirunal College of Music. Later he joined All India Radio, Trivandrum in 1964 and served there until his retirement in 1996. He is also a recipient of Kerala Sangeetha Nataka Academy award among many other awards. 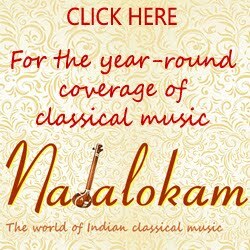 Of late, he had been teaching at the Teachers' College of Music, The Music Academy - Madras and is decorated with the title Sangita Kala Acharya by the Music Academy. While receiving the award on Jan. 1, 2010, he presented the acceptance speech on behalf of the other awardees Smt. N. S. Jayalakshmi, Trichy Sri R. Thayumanavan, Sri Akella Mallikarjuna Sharma and Sri B. M. Sundaram. On Dec. 25, 2009, he performed a concert for Carnatica at MGR Janaki College and on Dec. 26, 2009, he performed for Naada Inbam at Raga Sudha Hall. He was also present at the lec-dem session of Jayanthi Kumaresh on 'Different styles of Veena Playing' at the Music Academy on Dec. 27 and offered a value addition to Jayanthi's presentation about another vidwan M.K. Kalyanakrishna Bhagavathar and insisted that he should not be confused with M.A. Kalyana Krishna Bhagavathar, another veena exponent. The dedicated rasikas and students condole his death at this forum. 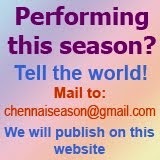 The photo above was taken on Dec. 25, 2009 at Carnatica's Samarpanam Festival held in Chennai. The report has two errors. Trivandrum R. Venkataraman was aged 71 (not 76) and his daughter's name was Jayashree (nor Devisri). By the way, Sri Venkataraman was my wife's maternal uncle, and Jayashree, her first cousin. My wife's mother (R Subbalekshmi, retired Professor and Principal of the Swati Tirunal Academy at Trivandrum) was the older sister of Sri Venkataraman. Hence my information can be relied upon as accurate. Thank you Sri LVR. The obit was based on the newspaper report, the post has linked to. These two error are now corrected.